"My mom was one of twelve siblings," says Maurice Harris, who grew up in St Louis but spent summers in Israel visiting family. "I spent lots of time on the beach and playing with kids." Harris was active in peace and reconciliation work at Wesleyan U in Connecticut. Afterwards, he worked half a year on a kibbutz, then moved to San Francisco, where he eventually directed the shoestring-budget Bay Area Holocaust Oral History Project. "I did the videography for 40 or 50 interviews," he says. "It was eye-opening." 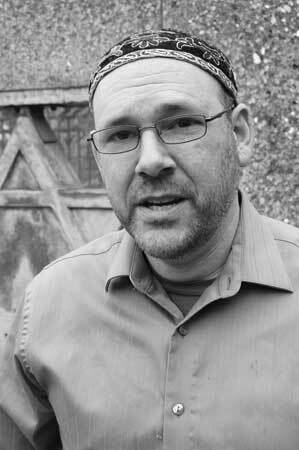 After five years at the progressive Reconstructionist Rabbinical College in Philadelphia and ordination in 2003, he found work as associate rabbi and head of the religious school at Temple Beth Israel in Eugene. "I support Israel-Palestine reconciliation as a member of the J Street Rabbinic Cabinet," says Harris, whose work for GLBT equality with the Religious Response Network earned him the Heneini ("I am here" in Hebrew) Award from TBI's Queer Chavurot. "Gay equality is not a secular versus religious issue." Though he is stepping down as rabbi at the end of July, Harris will stay on in Eugene. "I hope to make a living teaching and writing," he says. "And doing political work."